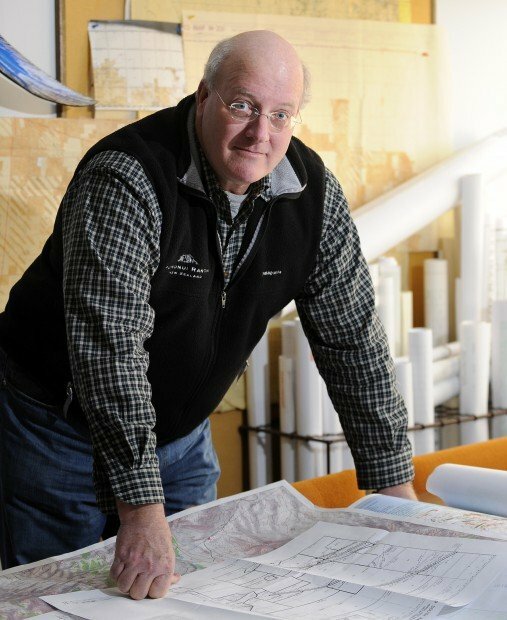 Tom Hauptman, an independent oil-and-gas producer and owner of KGH Operating Company in Billings, believes the Heath Shale formation north of Roundup has the potential to be this region's mini-Bakken field. Central Montana Resources executive, from left to right, Kevin Beiter, chief executive officer; John Koch, chief operating officer; Steve Harman, consulting landman; and Michael Beiter, manager of Billings operations. The Alberta-based company holds eight permits to drill in the areas around Grass Range and Winnett. This photo was taken last year in Petroleum County south of Winnett. ﻿The secret has been well-kept until now, but Central Montana is sitting on an oil field that some suggest could be a mini-Bakken, the boom that turned western North Dakota into the country’s top oil play. That was the tantalizing dessert served up recently by Tom Hauptman, an experienced independent oil and gas producer in Billings, during an economic conference luncheon speech in Billings. His petroleum pep talk was welcome news to business leaders who had been numbed by hours of sobering statistics and predictions of more years of slow economic recovery. Over the past four years, a dozen regional and major energy companies have leased acreage in the Heath Shale Formation. The rock runs about 30 miles north and 30 miles south of the Musselshell River from Lavina straight east into North Dakota. 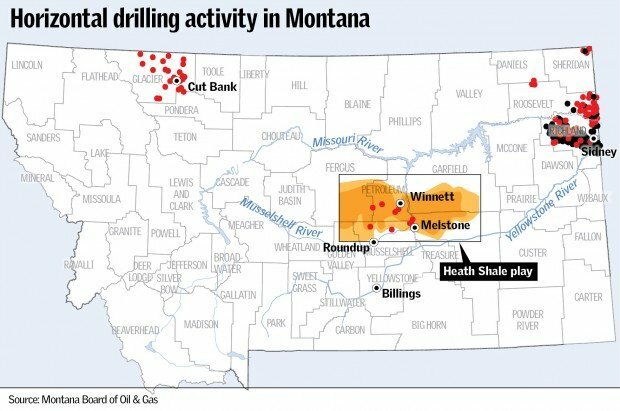 Tom Richmond, director of the Montana Board of Oil and Gas in the Department of Natural Resources and Conservation, said leasing has been busy, suggesting lots of drilling someday soon. But there also have been some problems, including the rock collapsing into the lateral pipes. (Hauptman) is one of the early adopters,” he said. The board has issued 28 drilling permits for the Heath, 12 in Petroleum County, 11 in Musselshell County and five in Rosebud County, and a handful of wells have or are being drilled. Central Montana Resources, a privately held oil company with corporate headquarters in San Antonio, Texas, with a business office in Billings, holds eight permits to drill the Heath. With Halliburton as a partner, Central Montana has drilled two wells south of Winnett near Flatwillow and one 30 miles east toward Grass Range, and is drilling a fourth near Winnett. By the end of this year, with 10 wells drilled and the lengthy testing period over, drillers will know if the Heath can be profitable or not, Koch said. Even so, the Heath is no Bakken. After a 30-year absence, the Bakken has drawn major oil companies back to this region and are spending as much as $1.5 billion per month on exploration and drilling, Hauptman said. He has no economic interests in the Heath, but said he remains an interested fan because Central Montana could use a shot of crude. Another interested bystander is Montana Petroleum Association Executive Director Dave Galt in Helena. “There’s a lot of Heath chatter in the industry, but there hasn’t been a big producer yet,” he said. Cirque Resources, a company formed in Denver in 2007, is getting ready to drill two wells east and west of Mosby. And a month ago, Cabot Corp. finished drilling a well northeast of Melstone, Koch said, but there is no word yet on whether it is commercially viable. In 1915, Ohio Oil Co., now Marathon Oil, dug Montana’s first commercial oil well in Elk Basin along the Montana-Wyoming state line. For half a century, geologists have known that the Heath held oil and natural gas formed from tropical forests and swamps about 320 million years ago, during the Mississippian period of the Paleozoic Era. Back then, North America and Eurasia were joined and the Great Plains lay under seawater. “But nobody has been able to get the oil out before,” Koch said. The horizontal drilling technology developed during the past decade made the Bakken revitalization possible and is now being applied to other shale deposits. Companies are drilling for oil and gas north of Big Timber and near Cut Bank. And last month, China’s National Offshore Oil Corp., invested $1.3 billion with a U.S. company to develop the Niobrara Formation. Believers have dubbed this formation, running from Wyoming down to Denver and spilling east into Nebraska and Kansas, the New Bakken. Hauptmann has spent 33 years in the oil and gas business, including living through the 1980s when the oil industry collapsed in Montana. Americans burn through 18.8 million barrels of crude oil a day while producing less than 5.4 million barrels, and that imbalance is creating economic opportunity, he said. But the U.S. has no clear policy for energy independence, and events keep jimmying the math. Crude oil prices have spiked above $100 a barrel again, thanks in part to revolutions across North Africa and the Middle East. British Petroleum’s disastrous Gulf Oil spill last summer shut down drilling there until the first permit to resume deep-water drilling was issued last week. Capping off the supply problems, U.S. demand for energy is expected to jump 44 percent over the next 20 years. By 2020, production from the Bakken should be 1 1.5 to 2 million barrels a day, Hauptman said. Contact Jan Falstad at jfalstad@billingsgazette.com or 406-657-1306. In country where creeks are named the Big Dry, where will the water come from to develop the Heath Shale oil? At the heart of the Bakken play in western North Dakota, each fracking job consumes 1 million gallons of clean water from Lake Sakakawea, the world's fifth-largest manmade lake, and from the confluence of the Yellowstone and Missouri Rivers. However, Tom Richmond, who heads the Montana Board of Oil & Gas in Billings, said existing industrial water could be used. "Until they get some experience, I don't know how fresh the water needs to be," Richmond said. "But there is probably enough produced oil field water that has been injected back into the ground or stored in Central Montana that could be used for fracking."